I’m gonna do a book review today. This was recommended to me by Rebecca Rust Lee after she read my book. She said I’d like it and I certainly did. First up, I’m not autistic, nor is anyone in my family, but I do have a good friend in Australia that is at the business end of autism. Leanne is chelating her kids using the Cutler protocol. Sorry, I should say; Leanne is successfully chelating her kids using the Cutler protocol 🙂 She told me earlier this year that her son had ‘emerged’ and was well and truly on the road to recovery and that significant progress had been made. Happy dayz! Leanne is a bit of a legend and we have been emailing each other for a couple of years. She is my only real connection to autism, although I have read about it during my travels because it is connected to the amalgam poisoned community. It thought I should get involved to learn a bit more about something that affects so many people’s lives today. ‘The Age of Autism’ is written by a journalist and a father of a child diagnosed with autism. It is NOT a book about how to get better from being autistic. They set out to discover what causes autism, or what might cause autism, or what factors might contribute to becoming autistic. They delved back into history to see if they could discover its roots, see when it all started. Is it a new disease? Or an old one that’s been with us eon’s? And this is where the book gets interesting for me. Basically the first half of the book, and it’s a hefty and wordy beast of a book, the first half of the book is all about mercury. Over 200 pages dedicated to the history of mercury in our environment and in medicine going back to the 1800’s, all the way up to today. And the history of mercury in our society is absolutely horrific. Mercury pollutes our world and was used indiscriminately and willy-nilly as a cure-all. Anything that was wrong with you back-in-the-day and the doctors smothered you in, or made you drink vast quantities of mercury. This sometimes cured the patient of their ills, but almost always caused them mega-grief and mega-hassle. If you think you got it bad, people 100 years ago had no hope and no chance. They just went mad and died in misery. I found it extremely odd there was nothing in there about how to cure autism, people are getting better after all, but I suppose that is another couple of books worth of writing. Cool book. I believe the more we understand about the underlying problem, the easier it is to do meaningful things to help ourselves. And that’s what this book is: background info on us and our problem: mercury poisoning in all its gory glory. 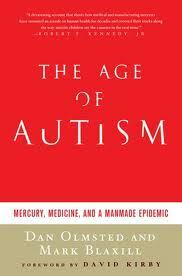 For that reason the book is relevant to everyone with mercury issues, not just the autism angle. Once people understand autism is just another form of mercury poisoning…I guess they too can take appropriate actions. This entry was posted in Book reviews and tagged autism, dan olmsted, mark blaxill, mercury poisoning, the age of autism by Sunshine. Bookmark the permalink.